After years of enjoying my favorite chocolate smoothie, I decided to branch out and try some new recipes. I was specifically looking for recipes that included greens such as spinach. This one, adapted from the CLEAN program meal plan, uses fruit to balance out the "green" taste, which makes it easy to forget about the spinach. Click the "Print Friendly" button below for a printable or PDF version. Blend until creamy (no visible green bits). 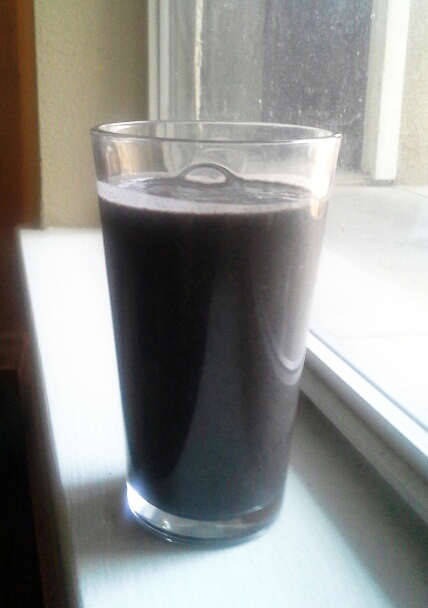 Blueberries are my fruit of choice for this smoothie. If you only have a flavored protein powder(s), such as chocolate or vanilla, choose the one with the most mild flavor. If you don't like the taste, consider buying a trial-sized packet of unflavored protein powder at a health food store.